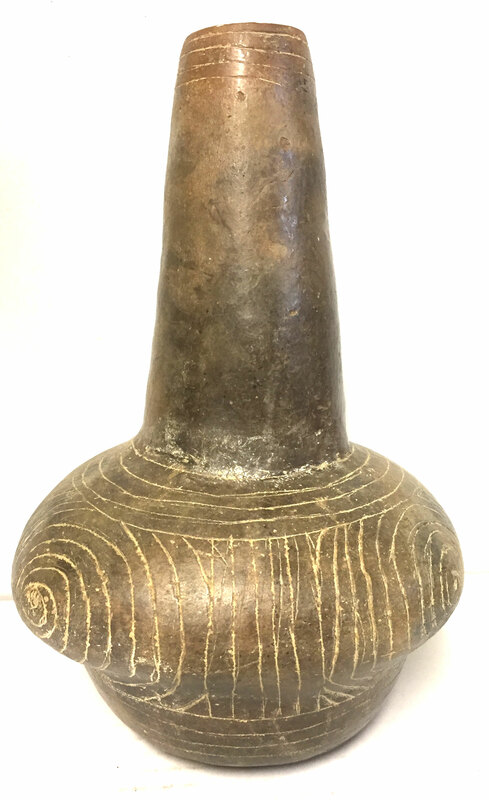 A Rare, Medium To Large Size, Very Well Made, Holly Fine Engraved Waterbottle That Exhibits Surface Sheen And Overall Clay Coloration Patination, Visible Surface Aged Firemarking, Correct Bottom Use Wear, Correct Style Decoration For The Type, Aging In The Decorated Lines, Correct Material And Manufacture For The Area Found. Found At The Crenshaw Site By Glen Kizza. Ex-Glen Kizza, Dr. Kent Westbrook, Sam Johnson And Tom Vaughn (# 2052) Collections. This Rare, Highly Collectible, Early Period Waterbottle Has Excellent Collector, With Slight Restoration, As Most From The Crenshaw Site. Includes A Ken Partain Certificate Of Authenticity.